I am starting to support SoapySDR in Quisk. 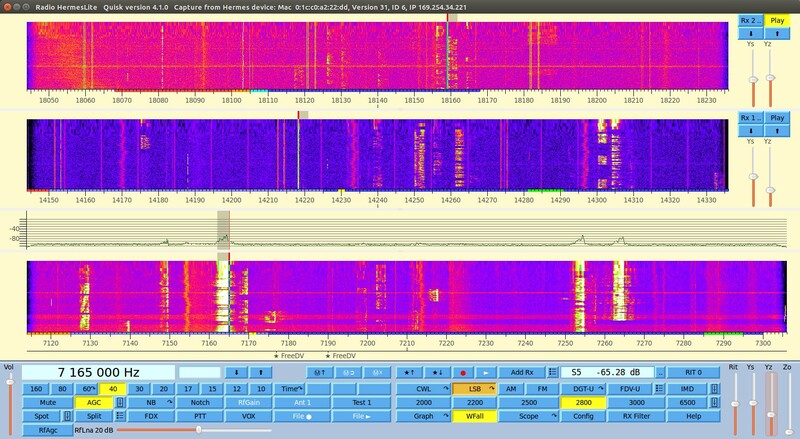 SoapySDR is an interface package used to connect many different kinds of SDR hardware to software clients such as Quisk. That means that Quisk can be used with many more SDR radios. Support is currently very incomplete, so this is not for the faint of heart. See this for more information. Please see CHANGELOG.txt for changes to Quisk, and the detailed documentation and help file. NOTE: The installation instructions have changed. The new method supports Python 2.7 in either 32-bit or 64-bit versions. A Python3 version of Quisk is under development. Here are two Internet groups for general Quisk support. There are other specialized groups you can find by a search. Quisk can control the HiQSDR. Quisk can control Hermes-Lite hardware. Quisk can control SoftRock hardware for both receive and transmit. Quisk can control the SDR-IQ by RfSpace, and several other hardwares. If you have supported hardware, then Quisk is ready for you to use. If you have other receive hardware, then you will need to change the file quisk_hardware.py to connect your receiver to Quisk. For example, if you change your VFO frequency with a serial port, then you need to change quisk_hardware.py to send characters to the serial port. The file quisk_hardware.py is written in the Python programming language, a very easy language to learn and use. I have tried to make Quisk easy to modify so it can be used for hardware other than my own. Here are some screen shots of Quisk. The usual graph and waterfall display are available. I dislike radios that look like computer programs so I designed Quisk with lots of buttons (a personality quirk of mine I guess). Hopefully Quisk looks like a radio and it is obvious how to use it. The red/yellow/blue bars at the bottom of the graph are the band plan. They mark the CW/SSB parts of the band, and show the ARRL additions.